Tech. Sgt. Jessie Keller, U.S. Air Force, served 13 years of active duty before going into the Reserves, where she is today. She has been deployed seven times – five times to Iraq, and two times to Afghanistan. Keller’s plan after high school was to go to college and then find work with animals. Instead, she entered the Air Force with a goal of working with the K9 program. 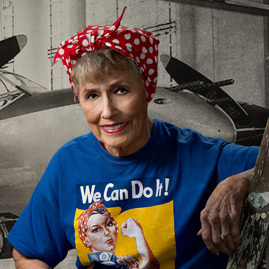 Knowing that it took five years to get into the program, Keller explored other jobs within the Air Force such as field radio telephone operator, driver, and shooting the big “fun guns,” the 240 Bravos. Working with animals is probably the most rewarding job a person can have, Keller said. Being a dog handler has been the best and the most dearest to her heart. “It’s a job that many people can’t understand unless you’ve had a dog actually save your life. When the dogs are with you, a lot of people look at them like, ‘Oh, this is a cute, cuddly thing you’re at home with and the kind of dogs that greet you at the door.’ My dog wasn’t a dog. We really don’t like to use that term or the word animal. We say it’s our partner. “These four-legged partners were there to save us. They went in day in and day out when we were exhausted as humans. But the dogs will go in. They were so excited for life and to work, all for a toy, really, and for the interaction between their handler. They just wanted to play. “I was able to tell certain things by the way my dog looked, the way he reacted, and I knew when something was wrong and I could go off of that,” she said. While deployed, Keller worked on missions “outside the wire” where she was typically the only female. In the midst of terrorist activity, everything going on was “very tricky,” she said. “No matter what type of training you had, no matter how many skills you had, it was kind of the luck of the draw. Are you going to step on a pressure plate that had an explosive attached to it?” This is what Keller lived with during her deployments. One mission took her and Chrash into an area where a four-person unit had been blown up. She and Chrash were sent in to help find the bodies and also the people responsible. “I worked with this team numerous times and it was heartbreaking for this camp. It was probably one of the most heart-wrenching times I’ve ever been out with combat. As soon as we landed I saw my team just standing there waiting. They were so excited to see the dog. I don’t know if it was because they were excited the dog was there or if it was because of what we were going to do and that we were there to try to help them out,” she said. The K9 partners often have more than one handler. Keller said Chrash’s handlers all worked together and gained knowledge from each other. Chrash received many awards, among them the Bronze Star and a Combat Action medal. He also earned the 12th Annual Animal Hero Award, “a huge deal,” Keller said. She has a Joint Service Award with him as well as a Combat Action medal. Keller worked with another K9 partner, Oscar, who was badly injured by an explosion. Although Oscar performed his duty immediately after the device went off, he was soon retired. Keller credits both Oscar and Chrash for saving her life. When K9 partners retire or pass away, their handlers and fellow soldiers give them a full ceremony as they would a human soldier. In Iraq, one of Keller’s commanders set up an all-female combat unit with 12 women in a unit of 200 men. The women went out on a two-day mission where they were shot at, communications went down, and they had to pull out a broken-down truck. “We had some kids come and tell us that there was a bomb. We found the bomb and then we had to clear the bomb. We landed a British OD team. We landed a helicopter, and we just stayed out there until the OD showed up and then we detonated the bomb. It was probably one of the craziest moments. And talk about Girl Power. It was the ultimate,” she said. “I couldn’t show any fear because, one, I was a girl and I knew they’d eat it up. Second, we’re leading the team and I couldn’t have them think I was nervous, because if I’m nervous, they’re going to be nervous. And if you’re nervous, the dog feels it and it can really reflect on the dog. So you have to go out there and you have to trust the dog, you have to trust you’re going to come home, and you just got to enjoy life. I’d like to think that’s how it went.